Bicycle accidents caused by parked cars are more common than you think. For bike riders, safely navigating their way on the roads requires not only following the current traffic laws with the California Vehicle Code (CVC), but also factoring in the potential hazards of drivers whose own knowledge of the laws might be lacking. This is especially true in urban areas like Los Angeles, Orange County and the Inland Empire. One specific area of interest involves cases where the presence of a parked car requires a bike to veer from its straight path. In far too many cases, this type of situation has resulted in the bike rider sustaining serious and sometimes fatal injuries after being struck by a vehicle. While some drivers think otherwise, bike riders in California are afforded the same rights as other vehicles under CVC 21200, with bike riders consequently expected to follow the same rules as their other driving counterparts. The obvious exceptions under such circumstances are bikes being banned from highways and other high-speed areas. Many cities and towns have designated bike lanes, though some relegate bike riders to sidewalks to limit the potential for disaster. These bike riders must ride with the flow of traffic, with those under the age of 18 are required to wear a helmet. While not required, those 18 and over are strongly encouraged to also wear a helmet to potentially limit the dangers of traumatic injury to the head or brain. Under CVC 21200, other riders are required to offer those traveling on bikes a cushion of at least three feet when the latter’s path is being blocked by another vehicle or obstruction. In most cases, that means a parked car, but can also involve such things as road construction projects, a pedestrian or an animal. What’s known informally as the “three-foot passing rule” can be tweaked in some cases to a shorter distance. That occurs when the vehicle makes the effort to slow down or otherwise enhance the safety concerns inherent with the situation. While it can often be impossible to determine the exact distance involved when the end result is an accident, the length is often what eventually leads to a proper disposition of any subsequent litigation. In some cases, the car that’s blocking the path of the bike may be illegally parked or located within a tow-away zone. 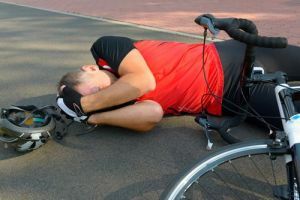 If that situation eventually results in an accident between the bike rider and another vehicle, the owner of the car that blocked the biker could face litigation as a result of their perceived negligence. Another situation that involves parked cars is CVC 22500, whether they’re parked legally or not, is that anyone getting out of the vehicle needs to check their surroundings. If it’s safe to get out, they should keep the door open only long enough to leave and either collect or deposit items to or from their vehicle. This law is in place because drivers have opened doors directly in the path of oncoming bike riders. Such accidents take place with greater frequency that might be expected and can be just as lethal as a standard collision between a bike and moving vehicle.